The Florida Association of Colleges & Employers is also known as FloridaACE and is formerly known as Florida Career Professionals Association (FCPA). FloridaACE membership includes representatives from higher education institutions within the state, including public and private colleges and universities; community colleges; technical school career centers and co-operative education personnel, as well as industry employers who recruit on Florida campuses. FloridaACE helps build Florida’s workforce by promoting innovative internships, cooperative education, and career opportunities through partnerships among career professionals in education, government, and industry. FCPA was conceived in April 1965, during a meeting of career services directors at the University of South Florida. In 1987, FCPA merged with the Florida Cooperative Association to form one organization called the Florida Cooperative Education & Placement Association. In June 2001, the membership voted to change the name to the Florida Career Professionals Association in order to be more and reflective of the membership. 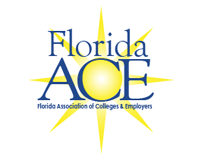 In 2014, the membership voted to change the name to the Florida Association of Colleges & Employers (FloridaACE). The current membership consists of approximately 380 members including the majority of the state of Florida’s public and private colleges and universities as well as many different businesses and governmental organizations who recruit on these campuses.